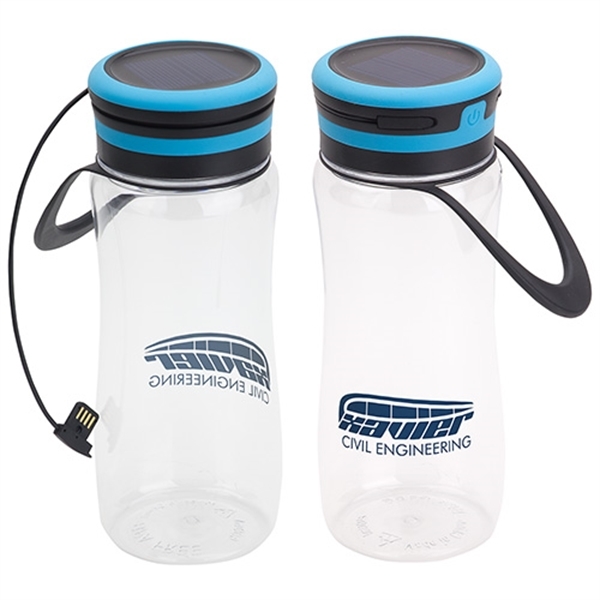 Put your brand ahead of everyone else's with this light-up bottle and solar lantern! It's a 20 oz. ABS Tritan container with a lid that contains a powerful 3-level light. The light can be charged with a cable, but there's a solar panel on the lid that recharges it as well. This provides up to 10 hours of illumination and is FDA certified and BPA free. This also includes a rubber carrying handle. Imprint this with your logo and offer this at the next tradeshow to make a strong impression! Size: 8 " x 2.875 " x 2.875 "